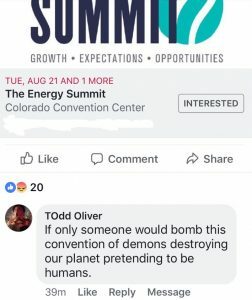 Today on Facebook, a man named Todd Oliver, a Bernie Sanders supporter according to his Facebook account, responded to an ad for a conference hosted by the Colorado Oil and Gas Association (COGA) by suggesting the convention should be bombed. While such rhetoric is entirely inappropriate, it’s become all too commonplace when talking about the oil and gas industry by folks who would prefer to shut down the industry through radical measures like Initiative 97. If you recall, PeakNation™, last year, the editorial page editor of the Daily Camera found himself in hot water after publishing a letter-to-the-editor suggesting that oil and gas workers should be shot by snipers. And the violent rhetoric didn’t stop there. Will radical environmental groups like 350.org disavow this rhetoric? Will the media ask them to?